The Anatolian Shepherd is a muscular breed of dog. The male Anatolian can reach heights between 28-30 inches and will weigh between 100-150 pounds while the female Anatolian Shepherd will reach a height of 26 to 28 inches and will weigh between 90-130 pounds. There are no color restrictions for the coat of the Anatolian Shepherd. However, it is most common to find them with white cream, “sesame” and piebald coats. The piebald coloring is simply white with large colored spots. Though the colored spots should not cover more than 30% of the body. The ears and mask of the Anatolian Shepherd are often black. The coat will feel wiry to the touch and should be quite thick due to their heavy double coat. 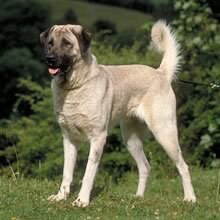 The Anatolian Shepherd also exhibits thicker hair around the collar to protect the throat. Anatolian Shepherds are very intelligent, independent and loyal. They are a breed intended for flock guarding, but this is not to be confused with herding. They will protect their flock with great intensity and will do so without human guidance or supervision, requiring very little training in regards to protection. The Anatolian Shepherd must be made aware that they are not in charge. It is imperative that the owner and family rank above the dog in the dog's eyes, as the Anatolian Shepherd can be very stubborn and may choose not to follow direction when they believe they are above the humans of the household. The Anatolian Shepherd will naturally like to roam, so a large living space is greatly preferred. Also, due to this it is recommended that this breed always be micro-chipped, as they may wander away if unsupervised. If owned as a family pet the Anatolian Shepherd will be protective of the family as well as the home and property, not allowing anyone in the home while their owner is away. Anatolian Shepherds are very intelligent, independent and loyal. They are a breed intended for flock guarding, but this is not to be confused with herding. They will protect their flock with great intensity and will do so without human guidance or supervision, requiring very little training in regards to protection. The Anatolian Shepherd must be made aware that they are not in charge. It is imperative that the owner and family rank above the dog in the dog's eyes, as the Anatolian Shepherd can be very stubborn and may choose not to follow direction when they believe they are above the humans of the household. The Anatolian Shepherd will naturally like to roam, so a large living space is greatly preferred. Also, due to this it is recommended that this breed always be micro-chipped, as they may wander away if unsupervised. If owned as a family pet the Anatolian Shepherd will be protective of the family as well as the home and property, not allowing anyone in the home while their owner is away. The Anatolian Shepherd makes a great family companion and guard dog. They are very intelligent and brave but not aggressive. The Anatolian Shepherd is known to be good with children, especially when they have been raised with them. However, it is possible for this breed to injure a child simply due to its size, and so children should be supervised with the dog. If introduced as a puppy, the Anatolian Shepherd will do well with other animals, including cats. It is imperative that the Anatolian Shepherd be well socialized at a young age to prevent severe suspicion of strangers and other dogs. If you are acquiring an Anatolian Shepherd for the purpose of flock guarding, the dog should not be treated as a family pet and should live its entire life outdoors with its flock. If given the job of guarding a flock, the Anatolian Shepherd is independent and requires no assistance or direction as its natural instincts will kick in. They do require socialization with humans to prevent issues with veterinary treatment as well as necessary grooming. You can find Anatolian Shepherd puppies priced from $200 USD to $1600 USD with one of our credible breeders. Browse through our breeder's listings and find your perfect puppy at the perfect price. The Anatolian Shepherd makes a great family companion and guard dog. They are very intelligent and brave but not aggressive. The Anatolian Shepherd is known to be good with children, especially when they have been raised with them. However, it is possible for this breed to injure a child simply due to its size, and so children should be supervised with the dog. If introduced as a puppy, the Anatolian Shepherd will do well with other animals, including cats. It is imperative that the Anatolian Shepherd be well socialized at a young age to prevent severe suspicion of strangers and other dogs. If you are acquiring an Anatolian Shepherd for the purpose of flock guarding, the dog should not be treated as a family pet and should live its entire life outdoors with its flock. If given the job of guarding a flock, the Anatolian Shepherd is independent and requires no assistance or direction as its natural instincts will kick in. They do require socialization with humans to prevent issues with veterinary treatment as well as necessary grooming. The Anatolian Shepherd requires very little grooming. They will require brushings only a few times each year. The Anatolian Shepherd sheds regularly in the summer months due to the increased heat and their thick coat. This is when they will need the most grooming. The Anatolian Shepherd is not suited for apartment living. This breed likes to roam as it was bred for traveling with the flock it is guarding. They are a very large breed that requires room to run and play in order to burn off excessive energy. The Anatolian Shepherd is not a dog for the beginner. This breed requires a very firm, loving and authoritative hand when training. Motivational methods appear to work best when training the Anatolian Shepherd. Training should begin at a very young age with this breed. The Anatolian Shepherd grows to quite a large size, making it difficult to correct them when full grown. The Anatolian Shepherd requires a lot of exercise. A yard with a fence is required, as the dog will determine its own exercise needs. However, a regular daily walk is still necessary if owned as a pet. The Anatolian Shepherd will always do best when they have a job to do, such as protect their flock. Anatolian Shepherd Puppies for Sale - Shipped Worldwide! Finding the right Anatolian Shepherd puppy can be dog gone hard work. PuppyFind® provides a convenient and efficient means of selecting and purchasing the perfect Anatolian Shepherd puppy (or Anatolian Shepherd puppies) from the comfort of your home, 24 hours a day, 7 days a week. Take advantage of our PuppySearch or leisurely browse our directory of hundreds of dog breeds, Anatolian Shepherd dog breeders, Anatolian Shepherd dogs for adoption, and Anatolian Shepherd puppy for sale listings with photos and detailed descriptions. Some Anatolian Shepherd puppies for sale may be shipped Worldwide and include crate and veterinarian checkup. Many Anatolian Shepherd dog breeders with puppies for sale also offer a health guarantee. With thousands of Anatolian Shepherd puppies for sale and hundreds of Anatolian Shepherd dog breeders, you're sure to find the perfect Anatolian Shepherd puppy.